Science fiction tends to be a big pile of lies smothered in falsehood. If sci-fi were to be believed, in the future, everyone would be a starship captain, a roguish smuggler, a greenskinned slave girl or a robot. What I want to know is where are all the tales of normal people in sci-fi? The space-barbers, the migrate space-workers, or whatever the future equivalent of a janitor is. At least I used to wonder, until I found Dicebox. 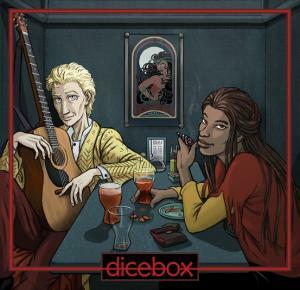 This week we’re delving deep into Dicebox, a comic by Jenn Manley Lee. The story follows two space drifters/migrate workers as they try to make their way in the universe and slowly (very slowly) uncover each other’s past. I make a couple mistakes in the show. One was making fun of the URL when there is a better one available (see our link above) the other was confusing the current chapter sections with total chapters. I’m sure I botched other things. This is why Jason and I can’t have nice things. We also discuss scary childhood memories, the fact that my child is a wuss and how we both learn new words. Join us, won’t you? Hey there guys. I’m doing a web comic at the minute.